Slain! is a game which has had a troubled few months since it’s release. Pre launch it was a seriously awesome looking game, with beautiful pixel art, a slammin’ soundtrack, and challenging, 2D action-platformer goodness. However, upon launch, it did not live up to expectations, it was harshly critiqued for being, almost unplayable, it was rough, buggy, and unfair hard. But, read on as there is a good part coming. Shortly after launch the developers went to work on taking all the rampant criticism and began improving the game in nearly every conceivable way. Adding content, bug fixing, tweaking and reworking gameplay systems, and much more. After almost 4 months of constant work, the developers have relaunched the game as Slain: Back From Hell with them citing it as being the game it was meant to be at launch. Well seeing the much more positive response, and the hard effort from the developers that has gone into the game I decided to take the dive and purchase Slain this time around. My takeaway? This is a fantastic game, and the care that was put into it shows. Upon first starting to play one thing is very evident, Slain is a beautiful game. The pixel art and animation are absolutely top notch, and some of the finest I’ve seen in a game in a long time. Every aspect of the game’s visuals appear to have been gone through with a fine toothed comb making sure every last detail is spot on. Add in the amount of life that the environments and characters are given through the stellar animation work, and you have some wonderful eye candy. Not to mention that the art direction is absolutely stellar. Take a bunch of heavy metal album covers and bring them to life? This is what you get, splashed in blood and gore, Slain throws you straight into a world of your metal dreams, and it is a wonderful place. The next thing that will be immediately brought to the forefront of your attention is the soundtrack. Ever wonder where all the games with the metal tunes are? Well look no farther, Slain brings the metal in spades, composed by Curt Victor Bryant formerly of the band Celtic Frost. The OST undoubtedly.. Slays. Every piece is full of headbanging glory and couple it with the visuals, you have quite possibly the most metal game ever made, Dethklok would be proud, if only Adult Swim would allow them back out..
Alright, I’ve prattled on about the soundtrack and graphics long enough, what about the game? Short version, it is very fun. 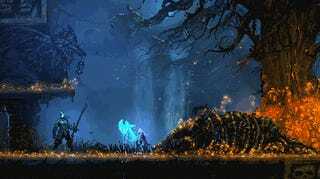 Slain is a 2D action platformer, primarily focused on the action part. The gameplay will find you controlling Bathoryn jumping and slashing his way through the 6 zones featured in the game. The platforming segments of the gameplay are mostly enjoyable, and have a few nasty traps in store to catch you off your guard, but overall the platforming feels very, safe. There isn’t a lot that makes the platforming parts feel very memorable and overall the platforming seems like a stepping stone to get you into your next fight. The combat in Slain however, is just pure fun and makes up for the shortcomings in the platforming elements. Combat consists of a simple combo attack Bathoryn can do, along with an aerial slash, and magic, which consumes mana very, quickly so you must save your magic for when it’s absolutely necessary! Bathoryn also has a dodge, and a block which can be used to parry enemies and regain some of your spent mana. All of these moves come together to create a simple, yet cohesive and rewarding combat system, fights are challenging, and require skill and patience to master some of the trickier ones. With all of that said, Slain shines it’s absolute brightest when the platforming and combat merge into one being. The segments where you are frantically jumping between platforms all while being assailed by your enemies are, tense, difficult experiences, that when you finally make it through them feel like an accomplishment. However these sections are few and far between so savor them when you’re cursing their name. Prepare to see this screen many times, you are going to die. The combat also features an elemental system, Bathoryn has his standard sword, which can be bathed in flame or coated in ice to form an icy axe. While this elemental system exploiting weaknesses is a good idea on paper, in practice I never felt as though it really meshed with the rest of the mechanics. There were scant few enemies to use a certain element on, and on those few it never felt satisfying to exploit their weakness, there was nothing that really gave me an indication that the witch does not like fire while cutting her down with my fire sword. Seeing the element get used for environmental puzzles would have been a phenomenal use of it, but they are only used in combat scenarios which really seems like a missed opportunity. 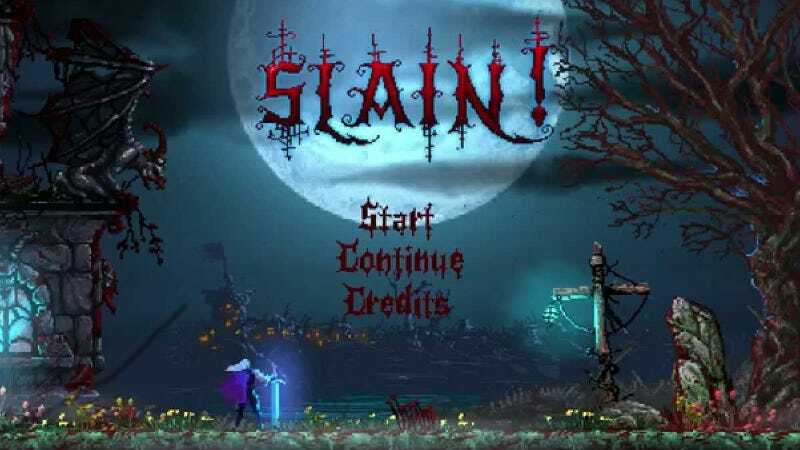 Slain features 6 stages to battle your way through and each one brings it’s own look to the table, from a poisonous sewer, to a witch infested swamp, all the areas have their own distinct looks and coupled with the music accompanying each area you can really get lost in the atmosphere. However, with each level having a unique look, the designs began to feel a little samey through the course of the game, start outside and fight your way through enemies, then go inside a cave/tower/etc and fight enemies, but with more traps scattered. With the games fairly short runtime this was never a major issue, but with the distinct visuals each level brings, seeing that incorporated into the level design would’ve made the levels themselves much more memorable. All 6 levels are difficult and feel rewarding when you finally reach the end and get to fight the boss of the area. The boss fights in Slain are excellent, memorable encounters. Each boss feels distinct, bringing their own tricks to the fight requiring you to test your skills to conquer them. At the end of each boss fight you get to honor the Metal God which is quite possibly the greatest thing I have ever done in a game, and alone makes the game worth a purchase. That about wraps up my feelings for Slain a brutal experience, which will make you feel like a god of metal, bathed in blood and sweat. Despite the few warts that the platforming and samey levels can bring, the combat, music, and visuals elevate Slain into an experience that is absolutely worth the asking price after all the hard work the developers have put into it to make it the game it is now.